This morning I was driving through Valley Forge Park and had stopped on the side of small wooded lane to take a picture of a squirrel. In my rearview mirror I saw a van coming up behind me, so I put on my blinkers and hoped it would pass. When I looked a little closer I could see it was a park ranger. So, I put the car in gear and headed on - just a little annoyed. About a 1/4 mile down the lane the ranger put on his blinking lights and signaled me to pull over. Oh dear….. I pulled over and waited for him to come to the car. I put down the window and he asked me in an authoritative voice to "Please put my hands on the steering wheel." Which I did. Then he asked me for my license and registration. He said I was being stopped because my brake light on the driver's side was out and he would need to write it up and give me a warning. I said that was fine. He then took my license and registration and walked slowly back to the van. 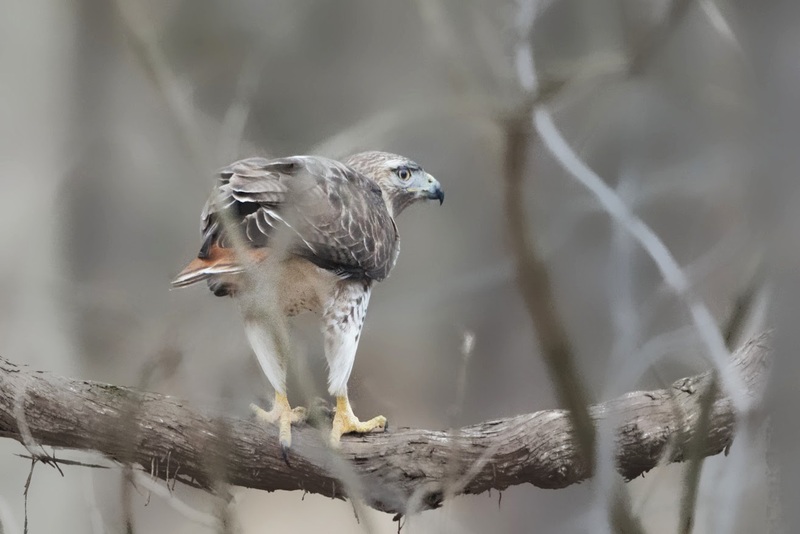 As he was walking back, a red tailed hawk dropped down in the woods - right outside my window. The hawk grabbed a little mouse and flew up on a curved branch and started having breakfast. I decided - perfect time for a picture, so I put the lens outside the window and voila. Although I tried to interest the ranger in wildlife photography, he was in no mood…..